I know what you’re thinking: this woman has finally lost her mind. But I kid you not. I invented Apple Pay. My friend Angela can vouch for me. For those of you still living in the dark ages (not judging – I love to visit there myself), with certain newer Apple devices you can set up Apple Pay through the Passbook and pay for stuff with your phone. Basically, it’s a digital wallet. You can read more about it HERE if you are interested. I don’t know how it works. Magic, I guess. Still, I invented it. Angela and I dabble in writing screenplays (bear with me), and in 2013 prior to the existence of Apple Pay, I started a screenplay that took place ten years in the future. The protagonist was a girl named Liberty and she was born on September 11, 2001, and when the story took place in 2023 she was twenty-two years old. Back to Apple Pay. 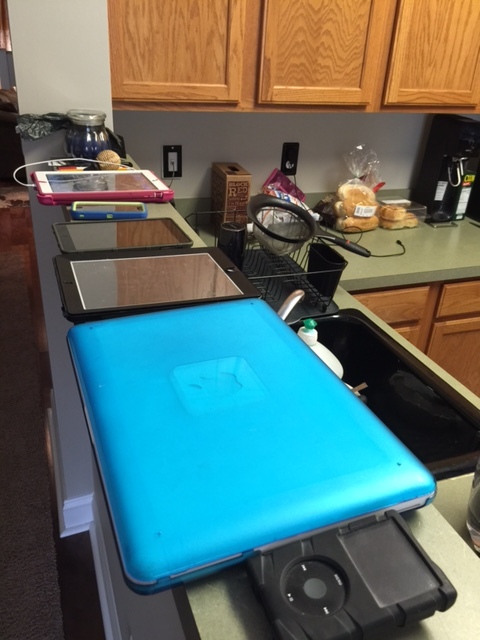 So in my screenplay, people use their devices for everything. They unlock doors by scanning their phones over lock pads. They don’t shop anymore, instead using their devices for ordering anything they need. They have to travel far distances to find cash – cash is a thing of the past. Libby finds an underground bar that’s a throwback to the old days. It accepts cash only and in order to enter you have to leave your device at the door. Many people turn away when they realize they have to separate from their device. Libby comments that people don’t go anywhere anymore – they attend school on-line, their personal trainers are on line, books, television, radio all on-line. Nobody drives anywhere (lessening our dependence on Big Oil), except people delivering packages. In my story, phones don’t even have a phone function anymore – nobody talks live. People call their device their “smarts,” deleting the “phone” off the end, and providing a not-so-subtle reference that these devices have become an extension of people’s brains. Apple Pay, right. You know where this is going. Of course, in Libby’s world, all you need to do to pay for things is to scan your device over a register or a machine. As an example, I wrote a scene where Libby goes to a coffee shop that has only one employee. She self-orders her coffee by tapping on the buttons on the coffee machine, then goes to the “register,” scans her smarts, and voila, done. Then she sits and charges her phone at the table. See. Apple Pay. I INVENTED IT, people! I have to admit that Apple trumped me on the Apple Watch. As I wrote the screenplay, I debated how these people would carry their phones around comfortably (I did invent charging stations for them in the middle of the sidewalks, and like everywhere, to take care of the pesky battery issue). As you can imagine, these devices were people’s entire lives and hell broke loose if they were lost or damaged. My brainstorming led me to some sort of special pocket on all clothing. Apple Watch is a way better solution. DAMMIT! Smart Apple people . . . Anyway, if anyone in Cupertino is listening, please contact me. I have other Apple ideas I’d love to share. Seriously, I missed my calling. I belong at Apple (or in Hollywood, if anyone wants to buy my half-finished Libby script before the entire thing comes true 🙂 ). My house or the Apple store? You decide. (Missing from picture: a Nano Shuffle, two iPhone 6 pluses, and an old school iPod touch). Now I know who to blame. I want to be buried under an Apple Store. hahahahaha! Nice! I always knew you were ahead of the curve!